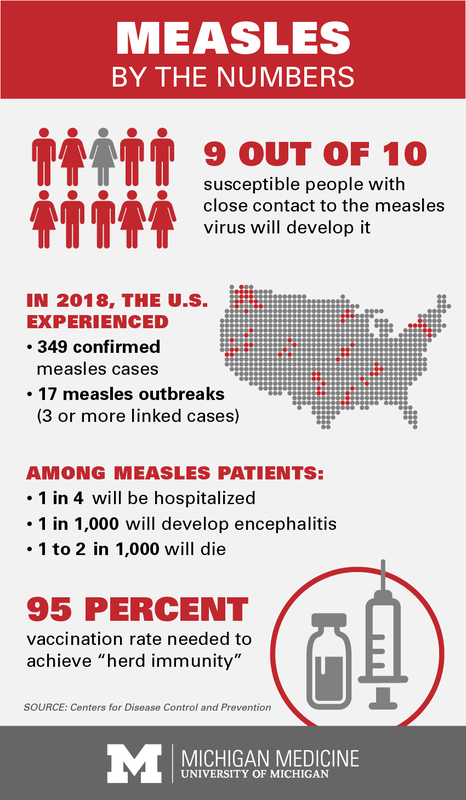 What’s causing the 2019 current measles outbreak? 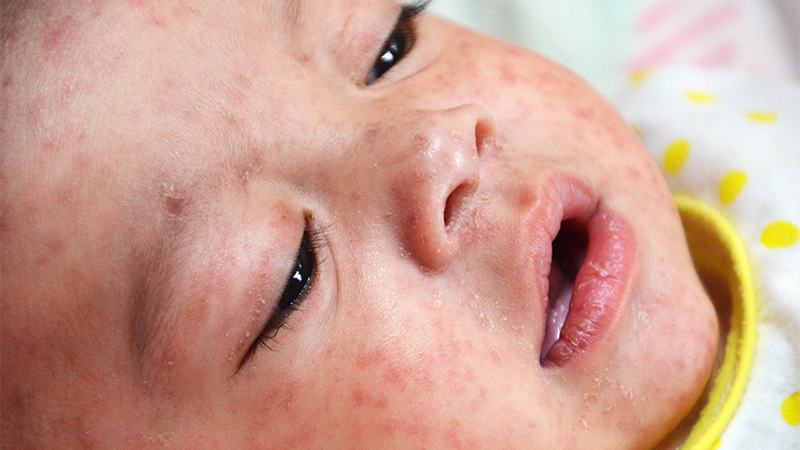 Many people believe measles poses no public health threat. The highly contagious infectious disease seems relegated to another era or parts of the developing world. But a recent measles outbreak in Michigan – and in Washington State where the governor declared a state of emergency – proves that the illness isn’t gone for good. But taking action is simple: Unvaccinated residents and those who are unsure if they’ve been vaccinated, should get vaccinated. The preventative measles vaccine, which is administered over two doses at age 1 and 4, respectively, provides lifelong protection. The Michigan outbreak is travel-related, but there’s increased harm to the community when families shun vaccination. 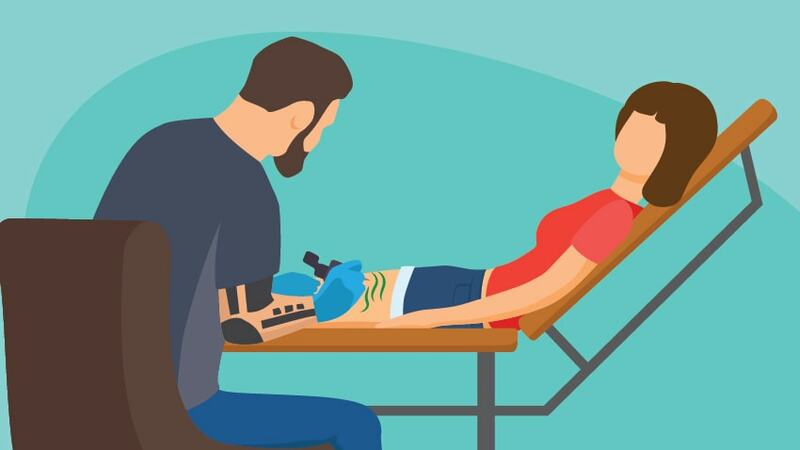 “Most of the people that have diagnosed (in Washington) are unvaccinated children,” says Kelly Orringer, M.D., director of general pediatrics at University of Michigan C.S. Mott Children’s Hospital. “In our practices we almost never see children who are unvaccinated because their parents can’t afford the vaccine. In 2018, Michigan had 19 cases of measles, the most reported in the state since 1994; the majority of people who got measles were not vaccinated. The measles vaccine has a small risk of minor side effects, such as fever or rash, and no link to autism. Parents should instead focus on making sure their kids are immune to the virus, says John LiPuma, M.D., director of pediatric infectious diseases at Michigan Medicine, who recalls treating a measles outbreak among Philadelphia youths in the late 1980s. “I cared for lots of children with measles and I can tell people, very sincerely, these are some of the sickest kids I’ve ever seen,” he says. A viral infection of the respiratory system, measles has no treatment. And its initial danger lies in the ease of transmission. Measles can spread via coughs and sneezes, and the infected droplets may survive for hours or days on surfaces. Traces of the virus, once expelled, also can live for several hours in a confined airspace, such as an airplane or bus. Once exposed, the unvaccinated have little defense. Ninety percent of them will contract measles following exposure to an infected person, according to the Centers for Disease Control and Prevention. A person cannot get measles more than once. Still, the disease isn’t something children should experience at all. The illness may take 7 to 10 days to shed via respiratory secretions or stools. Worse, it can often lead to severe complications that include pneumonia, conjunctivitis and encephalitis (swelling of the brain). One or two of every 1,000 affected children will die from complications related to measles, the CDC reports. "When we prevent diseases like measles, they’re not seen by the public. People tend to forget how dangerous they are." An infected person won’t initially show signs of measles in the first one to two weeks. He or she may then experience a fever and a telltale measles rash most commonly associated with the disease. Other symptoms include a high fever, cough, runny nose and red, watery eyes. These patients, Orringer notes, are very sick and very uncomfortable. Likewise, vaccination rates of 95 percent or greater create what doctors call “herd immunity” to decrease the risk of spreading measles. That’s crucial for protecting children younger than 12 months who aren’t yet eligible for the shot. Orringer urges parents to check that friends, relatives and caretakers are vaccinated. Still, Orringer and LiPuma note, the recent Washington outbreak — where transmissions occurred in an airport and at an NBA basketball game, among other places — should prompt hesitant families to take action. “When we prevent diseases like measles, they’re not seen by the public. People tend to forget how dangerous they are,” LiPuma says. “Second, we’re up against a lot of misinformation widely available through social media and the internet. 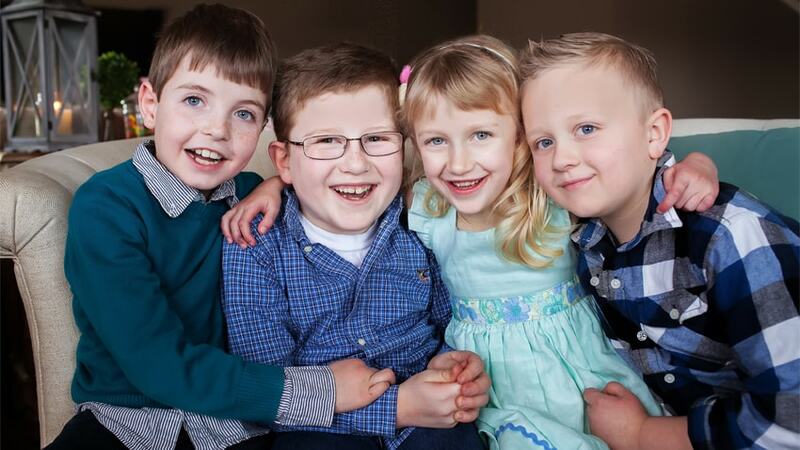 Learn more about recommended vaccine schedules at MottChildren.org.